In our last newsletter, we shared the story about how Joey’s Pizza business in Munich, Germany has benefited from incorporating ebikes into their delivery fleet. Hot on the trail of the growth potential in the rental market, A2B has developed a sturdy, everyday ebike model, designed specifically for the rental market. The bike has a stable hand-welded aluminum frame and is equipped with a front wheel drive. The unisex aluminum frame is available with a choice 26" or 28" wheels. The Sony battery pack has a capacity of 11.25, 14.5 or 17.5 ah. The bike comes with a choice of three, five or nine levels of pedal assist. And with a seven-speed gear system from Shimano and a Shimano coaster brake on the rear wheel, the bike is extremely reliable and robust. The comfortable saddle and suspension seatpost also make this a solid and enjoyable bike to ride. All bikes ordered arrive from the factory already equipped with a frame lock and puncture protection. As with our current range of ebikes, servicing and spare parts will be provided. 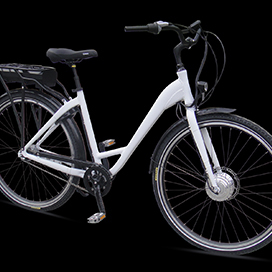 The rental market presents great opportunities for ebikes. From hotel chains looking to provide their guests with an easier way of exploring the local area, to car dealerships that spot a gap in the market for customers needing a complementary mode of transport whilst their car is being serviced, the possibilities for rentals are numerous. The A2B model is aimed at customers looking to develop a business fleet, and can be branded according to customer specifications. The minimum order is 100 units and the lead-time from receipt of orders is three to four months. To find out more or to place an order, simply contact your A2B representative.